A battery charger is a device used to put energy into a secondary cell or rechargeable battery by forcing an electric current through it. Some battery types have high tolerance for overcharging and can be recharged by connection to a constant voltage source or a constant current source. A simple charger of this type require manual disconnection at the end of the charge cycle, or may have a timer to cut off charging current at a fixed time. Other battery types cannot withstand long high-rate over-charging. 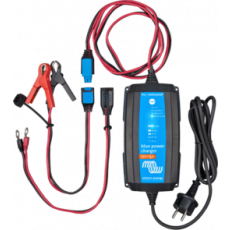 A trickle charger provides a relatively small amount of current, only enough to counteract self-discharge of a battery that is idle for a long time. Slow battery chargers may take several hours to complete a charge; high-rate chargers may restore most capacity within minutes or less than an hour, but generally require monitoring of the battery to protect it from overcharge.